Ellenville Public Library & Museum (EPL&M) is proud to present “Lost Hamlets of the Rondout Reservoir,” recipient of the Greater Hudson Heritage Network Award for Excellence. Between 1936 and 1952, a massive engineering project took place in order to provide New York City and surrounding localities with additional drinking water. 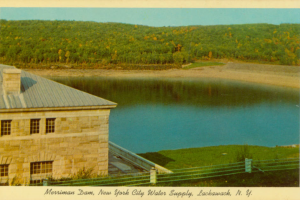 The purpose of this exhibit is to raise public awareness concerning the impact that the Rondout Reservoir had on the displaced communities of the Lackawack Valley. It is hoped that it will provide an appreciation for the pure water we may otherwise take for granted. The exhibit draws from extensive primary source documentation contained in the collections of Ellenville Public Library & Museum. The exhibit presented at the Persen House is a sampling of the complete exhibit available online at hrvh.org. The online exhibit was created by Sandy Marsh, Digital Archivist for EPL&M, utilizing the wealth of primary source materials held in the library's collections.